These equal sets worksheets for kindergarten come in two different flavors. 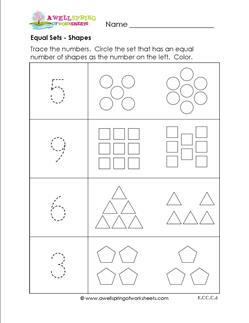 One “flavor” is a set of worksheets where students trace a number and match the number with the same number of objects by circling the set. 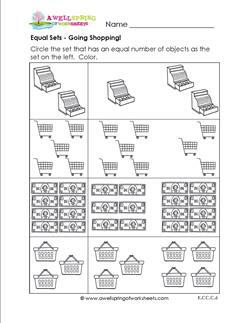 The second “flavor” is a set of worksheets where a set of objects is presented and kids identify the same number of objects by circling the matching set. Talking about flavors reminds me of my favorite ice cream…but let’s not get distracted! 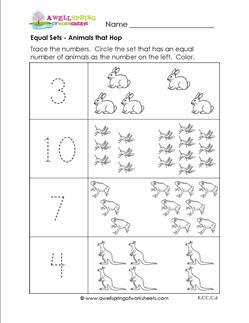 Please go to this page to see all the comparison worksheets for kindergarten. From Australia to the rainforest we've put animals that hop in these equal sets! Circle the set that has an equal number of animals as the number. In kindergarten shapes appear everywhere - even here in this equal sets page! Circle the set that has the equal number of shapes as the number on the left. Color the shapes. Equal Sets – Get Ready to Garden! Ready for a day outdoors? 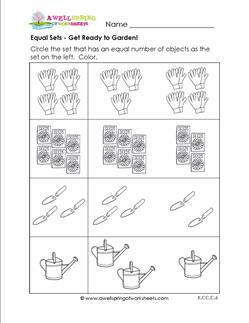 Let this equal sets gardening worksheet inspire you. Circle the set of tools that has an equal number of objects. Equal Sets – Going Shopping! Let's go shopping! Load your baskets with all kinds of goodies...Circle the equal sets of dollars, carts, baskets, and cash registers as the sets on the left.